FORT MYERS FL Vending Machine Service Companies! 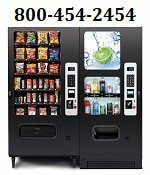 Offering Free Vending Machines: Snack, Soda, Coffee, Food, Frozen, Healthy vending, Micro Markets, Amusement Games and repair services for your employee breakrooms! Please contact these vending service companies direct for more information about their products and services. Americas Vending Depot – We are a highly rated Vending Company that sells “As is”, Used & Refurbished Vending Machines USA! Including: Food, Drinks, Snacks, Ice Creme, Coffee and Late model machines with credit card readers available. We Refurbish Vending Machines & include a 6 months warranty! We also repair machines, move them and ship your machines directly to you in USA! We now offer you NEW VENDING MACHINES!!! Authorized distributor for AMS, Conlux, Coin Co, Royal, and Vendo machines. Berg Vending Company – Vending machines at No Cost To You! Vending Soda, Juice and Healthy Snack Alternatives. Based out of Orlando, FL. Pro Vending – Vending Machine and Office Coffee Services for offices in the South Florida. Including all new vending machines for sodas, snacks, coffee, food, outdoor kiosks, and automatic vending machine sundries for your specialty needs in Florida! Based out of Coconut Creek, Florida.